On Tuesday, the Los Angeles Dodgers will be in familiar territory when they add pitcher Hyun-Jin Ryu to the 10-day Injured List. Ryu was forced to leave in the 2nd inning of Monday’s game after straining his groin. Dodgers manager Dave Roberts made it clear after the game that Ryu was heading to the IL on Tuesday. However, the timeline for his return is unclear at this time. Ryu missed more than three months last season with a groin strain. When he was healthy enough to pitch, he registered a 1.97 ERA over his 15 starts. That performance set him up to get the opening day start for the Dodgers this season. 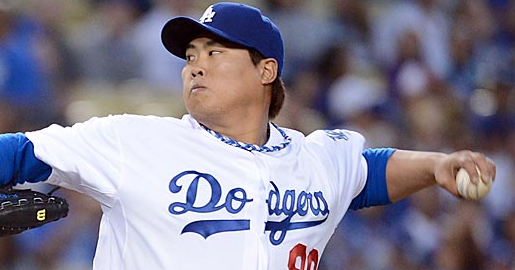 Ryu had won his first two starts before picking up the injury on Monday. Naturally, there is concern about Ryu hurting the same body part that kept him sidelined last season. However, the severity of the injury doesn’t appear to be as bad this time around. Roberts echoed that positive outlook after the game. Ryu went so far as to say that he would be prepared to make his next start. However, Roberts was quick to squash that idea, saying that it’s a virtual guarantee that Ryu will go to the IL with the team choosing to play it safe with him. Of course, complicating matters for the Dodgers is the fact that Clayton Kershaw and Rich Hill both started the season on the IL. The club also traded away Alex Wood over the winter. They don’t have the same kind of rotation depth as they did a year ago. Kershaw will make a rehab start on Tuesday before the team considers activating him, meaning he’s not an option until at least Sunday. Hill, meanwhile, is further away and not yet to the point of pitching in minor league games. If Kershaw is able to return following his next rehab start, it’ll ease the burden of losing Ryu for at least 10 days. However, the Dodgers are in a stretch of 17 games without an off day. That means they’ll have to find a replacement for Ryu’s next scheduled start on Saturday. They also have to deal with the fact that arguably their three best pitchers are all on the DL at the same time. On top of that, the Los Angeles bullpen is also a little worn out after Ryu’s early exit on Monday. In the long run, it’s best for the Dodgers to take the cautious approach with both Ryu and Kershaw. Both are critical to the team’s World Series aspirations. However, the early-season injuries to their starting rotation have placed an extra burden on the rest of their pitching staff. Even with most of their pitchers performing well early in the year, the Dodgers will have to endure a difficult stretch until they can get aces like Kershaw and Ryu back from injury.